Lemon Print Tank. Lemon Print Cardigan. I also love this lemon print dress! Skirt: Delpozo (old, last seen here and here). Yellow Sunglasses (under $40). Bag: Serpui Marie. Shoes: Madewell (also love these). You look like a fun summer drink, haha! Adore the color of the skirt and sunnies. You’re looking so adorable in this vibrant and chic outfit! This is too cute! This outfit scream Summer! I adore this color combination! So bright and lovely! What a fun color combination for spring! 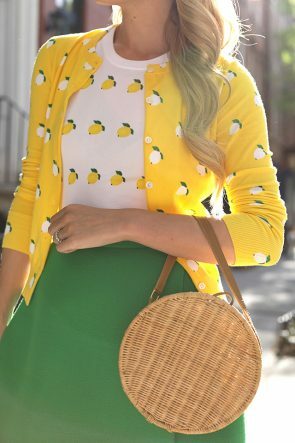 This is so cute, I love lemon prints! Gah! Love this so much! Perfect spring cheer! Love this …what a bright fun look!!!!!! I’ve been wanting this skirt since from the first time you wore it with Gucci sneakers, I’ve been trying to find a similar skirt but not luck. Love how you paired it with lemon cardigan and top, super cute. What a pretty skirt, I love the color and I have been loving all of your Spain photos! Looking beautiful in this combination of yellow, green and white.You have a great choice of color combination. Wow! I am happy to see your bag, I love that. Your are also looking pretty. This look is so fun! I love seeing you re-wear items in your closet. The lemons are too cute. Such fun prints!!! Gets me excited for the summer! When life gives you lemons make lemonade! I love this fun and fresh looking JCrew lemon ? tee and cardigan. Great look! Que look tan divertido y tan lleno de color, me encanta. She has developed a brilliant way of articulating shape and space by printing spray painted lines on bonded fabrics to mimic details like pockets, ties and seams. The most striking design is when hidden amongst the butterflies and bugs, the outline of a skull head emerges and lingers like a quiet and haunting presence. Cute photos, just looking at you makes me smile.